Don’t delay, call 508-378-7499 for your free quote today! Take the first step in finding out why our clients love us – your driveway will thank you for it! We will execute your design layout, inspect and install all necessary signage. 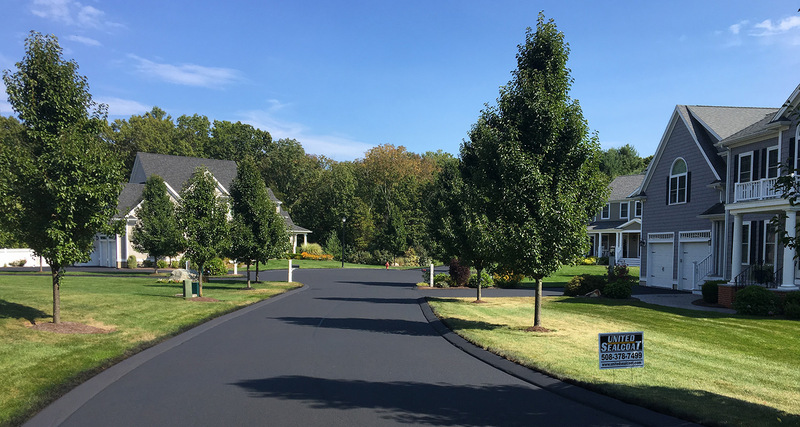 Fresh sealcoat brings a dark black color to the pavement, making it look and wear like new. Sealing asphalt cracks to prevent water from entering the base will extend the pavement life. Extend the life of your asphalt and dress up your business with a beautiful surface. Keep your customers, employees, suppliers and residents safe through the storm. Left unattended, potholes pose a significant risk to your customers or family. A clean parking lot leaves a lasting first impression with your customers. Ensure your compliance with the Americans with Disabilities Act (ADA). Proper repair of catch basins will increase the useful life of your parking lot. We use the best products available because that’s what you deserve. Our team has more than 40 years of property maintenance experience. We use quality tools to make sure our clients get quality results. We are in the business of making sure our clients are happy. Request a free quote today. You’ll be happy you did. We are a local family owned and operated company. Here are just a few of our 5-star Facebook reviews! I just want you know that I am SO happy with how everything worked out and how the driveway looks. I gave your phone number out to a few friends of mine that need their driveways done and loved how mine came out. I definitely loved it. Thank you so much. I just wanted to let you know that the job done at my house was AMAZING and my husband LOVES it. He was positive that we needed a new driveway and happy as h*ll to see we don’t. Thank you so much for SQUEEZING me into your tight schedule.